Michelle Flanagan received her Early Childhood Education degree from Towson University in 1990. She continued her education by earning her Master's in Education from Johns Hopkins University. Michelle has 16 years of classroom teaching experience along with eight years in school administration. She was selected to supervise student teachers, make contributions towards brain research and train teachers in hands-on science early in her career and was also chosen to participate in a cohort of educators in the Responsive Classroom, training teachers in its philosophy. In her years staying home with her young children, Michelle was a large-group teacher in children's ministry at Williamsburg Community Chapel, and also served in Women's Ministry and mentored William and Mary students. 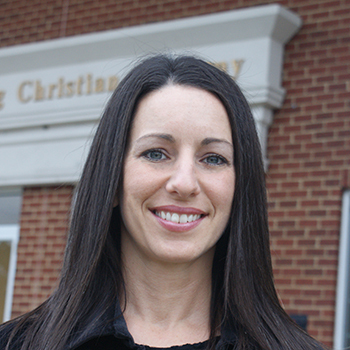 Michelle is the wife of Shawn and the mom of three children who attend or have attended WCA. Ryan graduated from WCA in 2016, Lindsey in 2017, and Lainey who is currently a junior. 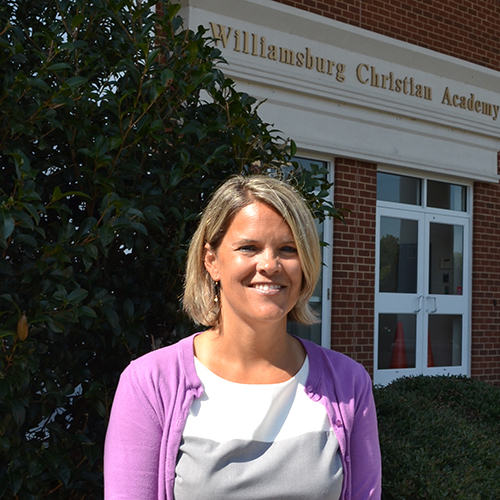 In addition to her duties as Lower School Principal, she will also be WCA's Lower School Art Teacher. Emmie Nice joined the WCA family in 2016 and is one of our K4 teachers. Emmie graduated from Williamsburg Christian Academy and attended Liberty University where she earned a Bachelor’s of Science degree in Family and Child Development and a minor in Psychology. Upon graduating college, Emmie worked as an assistant kindergarten teacher and an extended care teacher for children ages three years to fifth grade. Emmie has experience as an elementary substitute teacher and an intern at a local child development center where she devoted over 150 hours of working with infants, toddlers, and preschool children. Emmie’s most recent teaching experience was as a lead preschool teacher to four-year-olds at a local preschool and child development center. Emmie's goal with every student is to be courteous, act as a guide, mentor, leader, nurturer, and that her love for education shows! She was recently wed this past Spring to her husband, Greg! Lindsay Morena is a new teacher to WCA and will handle one of our two K4 classrooms. Lindsay grew up in Eldersburg, Maryland, and graduated in 2007 from Messiah College with a BS in Early Childhood Education. She has worked seven years as a preschool teacher and has also worked with AmeriCorps and at a nonprofit organization as a volunteer coordinator in Boston, MA. She has participated on missions trips in the U.S., a summer-long mission trip in Belize, and a short-term Mission Trip to Haiti with her previous school in Boston, in which she led a teacher training with the local Haitian teachers. She and her husband, Matt, have also coached recreational youth soccer teams together. She loves to run and play sports, ran cross country and track in college, and grew up playing soccer and softball. She loves to watch football, hike, bike, rock climb, and travel with her husband anywhere they can! The Morena's are seeking a great church home here in Williamsburg once they settle in. Emily Benham is the K3 Owl teacher at WCA! Emily graduated from Bishop Guilfoyle High School in Pennsylvania and earned her Bachelor of Arts degree in Early Childhood Education from Hood College. She has taught preschool at the Jewish Community Center and Walnut Hills Baptist Church Learning Center. Emily is a member of St. Bede Catholic Church and enjoys reading, scrapbooking and spending time with her eight nieces and nephews! Emily loves her preschoolers and wants to instill in them a lifetime love of learning! Staci Lanier teaches kindergarten and serves as the teacher liaison to WCA’s Parent Teacher League. Lanier has 15 years of teaching experience. Staci is a native of Augusta, Georgia and holds a B.S. and Master’s degree from Augusta State University. She holds an endorsement in reading and is a certified teacher support specialist. Before arriving at WCA, Staci had taught at Nottoway Elementary in Virginia and North Harlem Elementary in Georgia. Staci and her husband, Dusty, are the proud parents of seven-year-old Carter, a 3rd grader at WCA. The Laniers enjoy spending time on the ball field, the golf course, and fishing the Eastern Shore. The Laniers attend Williamsburg Community Chapel. 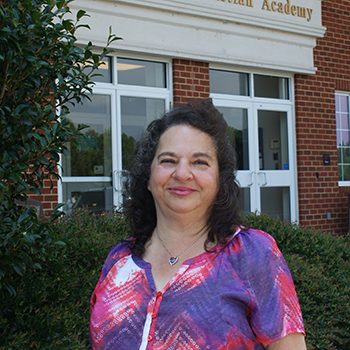 Kathy Watson returns for her sixth year at WCA and serves as the first-grade teacher. Kathy grew up in Hackensack, New Jersey and holds a BS from Pensacola Christian College. Overall, Kathy has twelve years of teaching experience, and she has a deep love and passion for science and learning. Watson is the proud mother of 11th grader Kailey and 7th grader Nathan, and her hobbies include walking through Colonial Williamsburg, watching movies from different eras, and reading books on the beach. Kathy and her family attend the Williamsburg Community Chapel. Nova is a new teacher at WCA for the 2018-2019 school year in 2nd grade. She is excited to join the WCA ministry! She has taught elementary school and Pre-K for approximately 15 years. Nova graduated with a BA in English and Bible in 2003 from Southeastern Baptist Theological Seminary in Wake Forest, North Carolina, and has her Masters in Christian Studies from there as well. She is currently pursuing a Masters in Elementary Education at Liberty University. Nova has also taught three years overseas in two different countries. She enjoys watching old movies, running, and reading books. She attends Harvest Fellowship Baptist Church in Smithfield. Her favorite Bible verse is "To me, the very least of all saints, this grace was given, to preach [to teach] to the Gentiles the unfathomable riches of Christ." Ephesians 3:8. 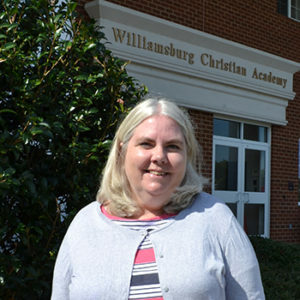 Hollyana Dickens is a new teacher at WCA after retiring from the Diocese of Richmond with thirty-one years of service. She taught third and fourth grades for 28 years in the Diocese and taught music for three years at All Saints Catholic School. She holds a Bachelor’s in Music from Johnson C. Smith University in Charlotte, N.C. Hollyana served three years in the United States Army after graduating from college. She has served as the Minister of Music, and Praise and Worship Leader, for her church as well as choir director for many groups throughout Richmond before moving to Williamsburg. She has sung professionally for many years and was a member of the Bell Choir at the Brandermill Church in Chesterfield. In her free time, Mrs. Dickens enjoys listening to all types of music (especially contemporary gospel), reading, and traveling with her husband and daughter. Ms. Naylor has been involved in education for over 30 years and is the Lower School Drama Program Director at WCA. A graduate of Daemen College in Buffalo, NY, with an undergraduate degree in Elementary Education, Cathy earned her M.Ed from UGA, also in Elementary Education, continuing with a minor in Reading/Language Arts. Through her career, Naylor has taught general classroom education, Chapter I Reading, Gifted and Talented Education, and has developed a Language/Performing Arts Program for children. She has written children’s stories and songs of various genres. The songs for her production program have been professionally produced and she is also a published author. One of her stories, ‘The Gropples, According to Luke,’ was published in 2005. She has brought improvisational theatre, dinner theatre, travel shows, guest performances, mini enrichment workshops, and interactive educational programs in communication skills to many students throughout the years, and continues to initiate some of the same activities here at WCA. Regina Doran teaches Library and Media at WCA. Before she was married she taught several years of preschool, Women's bible study, and was involved in Children's ministry. She then obtained a B.S. in Child Development and Family Relations from the Indiana University of Pennsylvania, where she worked in a Child Development Lab and preschool for several years. After raising five children with her husband and working as a substitute teacher, they moved to Williamsburg, where she taught Adult Basic Education and was a public school Literacy Interventionist. Regina obtained her Master's degree in Elementary Education at Liberty University and was just recently conferred a post-graduate degree, Education Specialist, in Curriculum and Instruction from Liberty. Chelsea Meisinger is our music instructor for the Lower School and also leads our lower school praise and worship services. Chelsea is a native of the Hampton Roads area, having grown up in Newport News, VA. She attended Woodside High School where she participated in the orchestra and studied music theory. During her time there she performed at the Boston Pops Theatre and became Concertmaster of the orchestra. Chelsea graduated from The College of William & Mary where she completed her degrees in French & Francophone Studies and Elementary Education, with a focus in Teaching English as a Second Language. Chelsea enjoys singing, songwriting, playing instruments, leading worship, reading, and watching movies. She moved to Williamsburg in 2012 when she married her husband, David and they recently welcomed their first child Cade! They also have two dogs, Maggie and Izzy. They attend and volunteer at Waters Edge Church regularly, where Chelsea also leads worship on occasion. Grace Henry has joined WCA last year and fills a myriad of roles, including the role of aide to all other Lower School Teachers. Grace will also be the monitor for our Before and Aftercare program. Grace grew up in James Hill, Clarendon, Jamaica, and graduated from Mico University, with a B.A. degree in Guidance and Counseling. Grace has over 20 years of teaching experience, serving as both a classroom teacher at several schools and as a senior teacher and acting principal at Park Hill Primary School. Grace also founded and operated a kindergarten in Clarendon, Jamaica. She enjoys singing, playing keyboard, and acting, and she founded the Silver Star Foundation, a humanitarian organization dedicated to feeding and providing financial assistance for the elderly in need. She is the mother of two sons, Nicholas and Christopher, a daughter Janel, and a grandson, who is enrolled at WCA. Grace attends John Baptist Church. Crystal joined the faculty of WCA in 2018. She is our lower school enrichment specialist, working with our twice exceptional and challenged students. Crystal graduated from Old Dominion Univertsity in 1998 with a Bachelor's Degree in Speech Pathology, with a minor in Special Education. 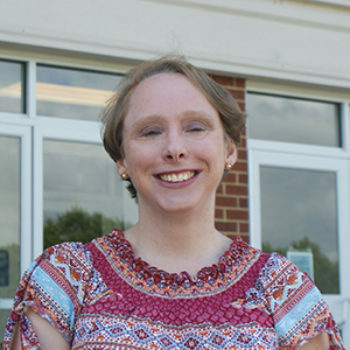 Crystal realized her passion was in special education and began teaching in the public school while she was working on her masters degree in special education from ODU. She left teaching after a few years to stay home and raise her family. Crystal returned to school last spring to finish up her masters degree at ODU and return to the field that she loves! She lives on a historical farm in Charles City with her husband and five children, three of whom currently attend WCA.